Thanks, I actually have the TP 2s 40c 5000 packs and was wondering if I could squeeze maybe a 6000 or bigger in there. Sorry, I can't help you there. All my packs are 2s 5000ma. and they fit fine. i have 2 maxamps 2s 6500mah 30c hard case packs. they fit but you have to push them in hard, getting them out is another story. i stopped running them, we run 7 min mains and a 5000mah is plenty big enough to make it w/o a bad voltage dump. the tray is set up to use 2 velcro straps also. i may cut the outside off of the tray and use the velcro straps to be abe to hold in larger batteries w/o having to pry them out w/ a screw driver. it would be nice for practice. the smc 8000mah 20c batteries are great packs a couple of my buds got them, but a tray mod. will be required. Any place sell the battery trays yet? I would like to buy a second batt tray for modding and keep the one in the truck for my 5000's. 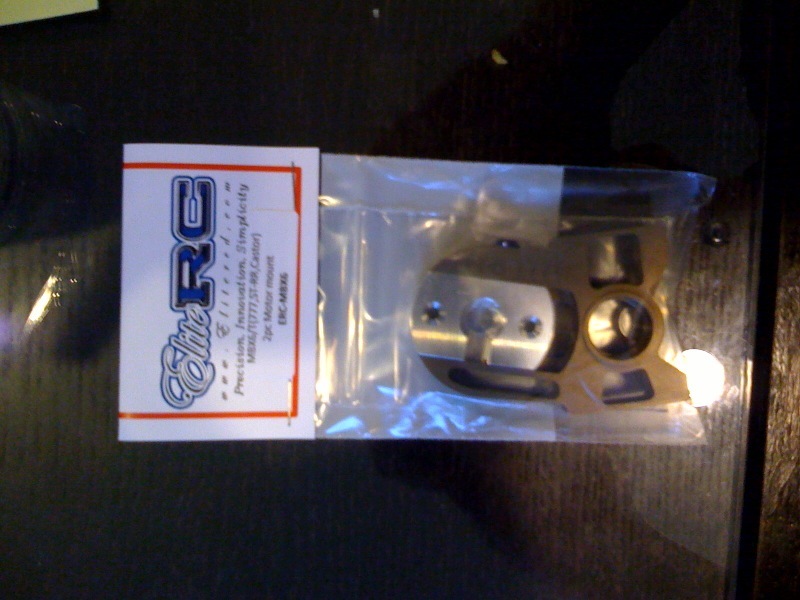 This is a pic of a Elite RC Mugen Mbx6 motor mount. Check the website at www.elitercd.com and the thread Elite RC 1/8 conversions. I run them on my 1/8 electric converted buggies and truggy. Demand is needed for the production of a Jammin SCRT mount. Last edited by titotime; 01-22-2010 at 05:52 AM. battery tray is 150mm x 48mm x 26mm. got my Jammin together, running a Tekin rx8 / novak 4.5 on 2s. The rx8 is a spare for our 1/8th buggies, and it's what I have available. Running stock gearing. ran it in a large parking lot for my test run has plenty of power. I'll be racing it saturday at an SC trophy race in an exibition class for 4x4s. I'll post how it does. I made a plastic brace for the front bumper, it comes accross the top of the existing brace and bolts to the top of the bumper.I'll try and get some pics of it. I boiled the front bumper as well but this should shore things up a bit. I bought SMC 6000 28c, fits fine on my SC10 truck, it is little bit longer than 5000 lipo. SMC 5200 2s 40c & 50c batteries leave plenty of room in length. Do you know the exact dimensions of teh 6000 packs? has chad or anybody put a starting setup anywhere. Jammin website, but there isn't anything there other than the blank setup sheet. Mine is on order but won't be here for another 6 weeks. All times are GMT -7. It is currently 05:51 PM.